flyer about the image left at my door. It was delivered a few weeks ago. 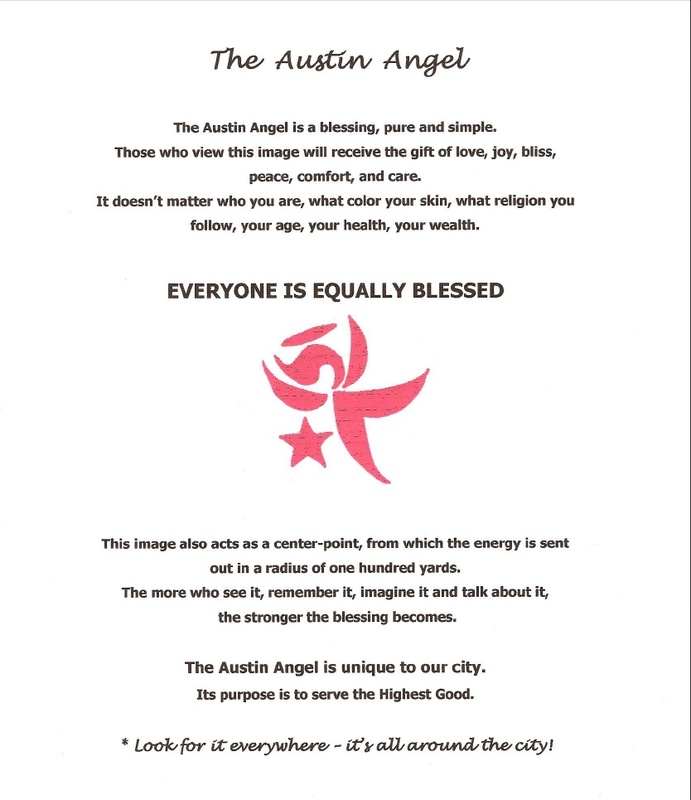 The angel image is small but apparently getting noticed. What do you think about it. Feel free to leave your comment about the new graffiti. My thoughts are that the flyer would have sufficed. 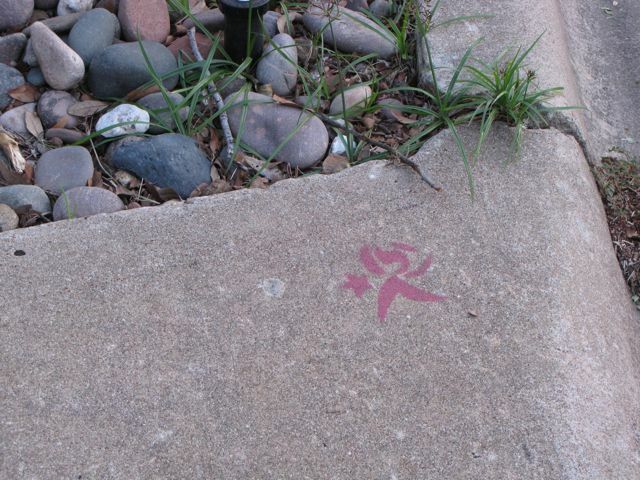 Stamping a permanent image on public/private property is a crime. The originators of this guerilla campaign knew that. That is why they have done this anonymously. Now that this has been reported to the graffiti abatement program it is very likely neighborhoods throughout Austin can look forward to splotch of grey paint everywhere a stamp appears. Oh yeah. A splotch of gray paint is SO much better than a dancing star girl! It’s not like it’s vulgar, spreading hate or even marking territory. I laugh when I think of all these angry people working so hard to annihilate a symbol of love and acceptance. What a bizarre world I live in. I love it! This is what makes Austin so unique. Now when I see the angel on my walking route I will remember how blessed I am to live in this great city and to be alive! Poop on those who feel otherwise! There is little hope for meaningful discussion when comments descend to emphatic scatalogical insults. It is unneighborly and certainly contradicts the message celebrated by the image in question. The message is not the problem. The medium is the problem. That is an important distinction. It is unneighborly to accuse those who take exception to the medium of being angry annihilators of loving symbols. Pot, meet kettle. Peace be with you. There are countless avenues to disseminate messages in today’s society. This comment board for instance. Graffiti is the refuge of tiny tyrants and scofflaws. Graffiti is a one-way conversation imposing it’s views on all who are subjected to it. It suppresses dissent. Please, be neighborly and recognize the neighborhood association was not consulted on this guerilla campaign, and apparently homeowners were not consulted either. Residents are left to decide what, if anything, to do about it. It is inherently unfair and unloving to act first and seek approval later. Many great faiths preach love of one’s neighbor. This does not extend to only those you agree with. I would prefer communicating that our community is a positive, inclusive place (by showing the stamp), instead of saying nothing (i.e. the grey spot). Why wouldn’t we want our community to have a reputation that we not only are concerned for ourselves, but also our neighbors? I’m not suggesting you need to give your neighbor a hug each morning (which actually might be a good idea). Instead, I’m sure you hope when you are away from your home and something suspicious occurs, that your neighbors would look out for you, that you in turn would look out for them. Otherwise we’re just a collection of homes, not a neighborhood. Whether you like the message or not it’s still Graffiti. Once we allow one person to put a little Graffiti symbol then we are giving the green light for others to do the same. Then inevitably we’ll have Graffiti with larger symbols and messages and their meaning may be less concise and possibly a bit controversial in the eyes of some. So then the question arises as to which symbols, markings and tags do we allow and who do we allow to do this? Do we really want to get bogged down with regulating Graffiti? I say no Graffiti of any kind. No exceptions. I can fully understand homeowners having a problem with something being spray painted on their private property no matter how positive the intended message (I spotted one sprayed on someone’s limestone wall at the edge of their property, and that would have upset me much more than at the edge of my driveway). We don’t seem to have a substantial graffiti problem in our area, but I’ve lived in places with significant issues (I remember more grafitti cleanup days than park cleanup days) and I’d be concerned about where embracing any grafitti could lead. Anyway, as far as we know it’s not a symbol marking territory, but you never know, a lot of things gather meanings not originally intended or are replicated by others in ways not originally intended. I could see this sort of thing approached like the folks who spray paint addresses on curbs, leave the flyer and let the homeowner decide if they’d like the symbol sprayed on the curb in front of their house. I think that most likely this was intended as a “random act of kindness” but the folks out doing it probably weren’t as thoughful or considerate as they should have been.